Instead of using the crying child, this picture is of Carolyn's son as a child. Since she did not have access to the metal numbers, she used chipboard, metal tape and the cuttlebug to make the numbers. Worked fine! Here are the roses made for the last tag. Did you do them too? We used a diecut approximately the same in size as the one he used on the flower. We made our flowers green and red vs. the aqua-blue color he used. Tricky to make, but pretty overall. 11 of the 12 are on display at the store. We'd love to know if you did any of them and to see them if you did. Enjoy! So, this seems like a good time to play another guessing game. We will be closed on Sunday the 3rd and Monday the 4th, opening back up Tuesday for regular hours. Inventory will be going on Sunday and Monday. I will find a special prize for the winner! ( Thanks for playing. Edited to add: The winner will receive a nice little packet of product perfect for this time of year. It includes paper, ribbon, stickers and key chain-- approximately $20 worth of product. It is on display at the store, but I couldn't get a picture of it for the blog. We all hope you had a wonderful Christmas day! Starting tomorrow, December 26th thru January 2nd, the entire store will be 40% off, that also includes already marked down items, yes that’s right 40% off and then 50% off. We will be closed January 3rd and 4th for inventory. On January 5th we will open with all the new Valentine lines, new classes, wonderful creative new ideas and love in the air. Call and sign up for our New Years No Frills-No Frills Crop January 2nd 10am-midnight $15. This is 14 hr. crop time only, no supper or other special activities. We have received several calls about people wanting a crop this weekend, so sign up quick! When scrapbook fever hits, it can be lots of fun. Santa couldn't think of toys until his book was done. "If only I could find a place with lots and lots of stickers." "We know just the place, boss. The walls are lined with packs. Just grab that empty toy bag and put it out our backs"
"What now, what now" said Old Saint Nick. "I want to do some more"
"Go to Crafty Scrapper, be the first one in the door"
The fourth day of Christmas will be so great!" The elves woke up early and completed all their chores. They knew that all they'd need that day, would be at their favorite store. They would wait outside the wooden doors until they were unlocked. but, coming on to College street, they had quite a shock. Parked outside of 308, they saw the sleigh they knew. It was loaded up with packs of glass, memory frames and capsules too. "Chipboard is on sale today" They yelled with all their might. With many things to choose from, they stopped to make a call. 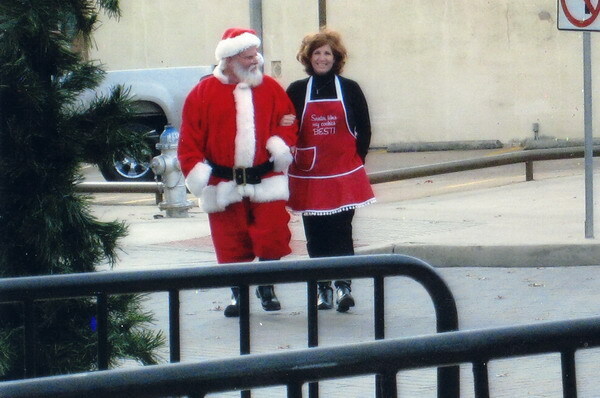 "I just got off the phone with Santa, he said to buy them all"
Mrs Claus asked Santa "What else does Carolyn sell? Does she have the Ten Seconds metals that cover things so well?" "She does" Said Mr Claus. "It's made by Cheryl D. and Megan"
"Better hurry!... and take the station wagon"
On the 8th day of Christmas, Santa was a wreck. "What to do, what to do, Oh..I've forgotten glue!" Of course, the elves were sent to town to pick up what he'd need. They went as fast as elves could go, but they didn't want to speed. While Santa plays with all the things we pick up at the shop." 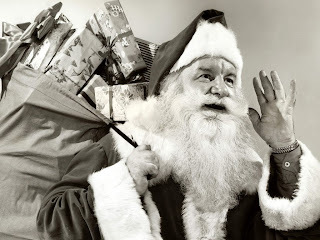 Even Santa has a list of things he wants each year. The elves went to town again along with eight reindeer. Metal corners, frames and keys were perfect for the cover. He needed other goodies too. This book was like no other. Some eyelets and some brads would be perfect on his pages. Santa had to make another trip to finish up his gift. Some flowers, leaves and sparkly bling would give it such a lift. It was a such a special date. He had made this gift in just 12 days, he kept up quite a pace. In his mind he saw the look upon her face. She opened up the gift from him and memories flooded in. She looked up into Santa's face and saw his great big grin! This scrapbook made for Mrs Claus. The best gifts in this world are our family and friends. 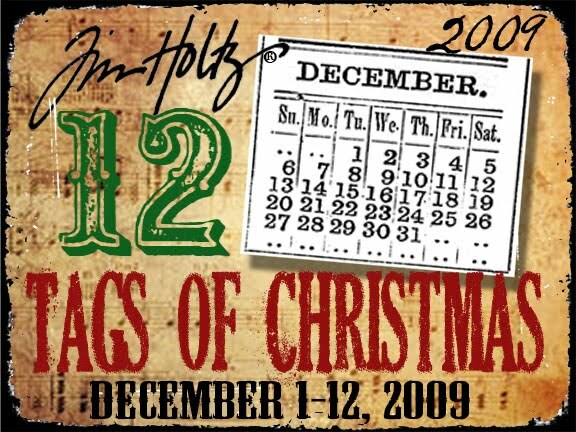 We thought we would share some of our tags and other information regarding the 12 tags of Christmas done by Tim Holtz this year. We found that we didn't have all the supplies and imagine that is how it was for most people. We thought we'd try doing similar techniques on a non-tag surface. Making plaids was a lot of FUN too. We made both cards he showed on his blog. We also did blue and other color backgrounds. We didn't have the German scrap, so took glittered cardstock and a border punch to make an edge for the tags. 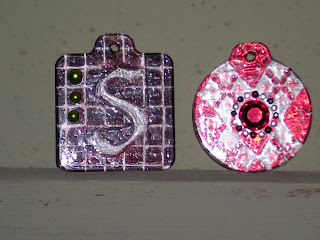 Slight adjustments on this tag included the Snow Marker on the tree and stamping on a scrabble tile. One of our favorite tags. Carolyn is going to put it on the front of her December daily book. Carolyn was home with sick child, and no keys at home, so she adapted and used the letter "R" with her family name hanging from it. Very cute huh? Well, I don't want to get too far ahead of you....I will post more in a day or so. In the meantime, all of them are on display at the store. Finished the 12 tags, working on the December daily and other projects. We thought you might enjoy seeing the tags we did and maybe some of the adjustments if we didn't have all of the items Tim used. Check them out HERE. It is still busy in downtown Waxahachie. If you didn't get to the home tour, you need to be sure to come this summer and/or next Christmas season. The skating rink, Bethlehem Revisited and other activities are still going on. Sunday (the 13th) the store is open 1 to 5 pm. Also, all of the postbound albums, d-ring albums, refill pages and extenders are on sale. 40% OFF. I know many of you are planning your day around that right now! The album sale is Sunday only. Also, there are still many items on the 50% off table....actually, we should say that more keeps being added to this area each day. This is a great time of year to pick up those albums too--time to get them all ready for photos and pages from your year. PS: If you didn't get an email announcing the sale, please go to the website and sign up for our newsletter. Here is the post I did at 9 this morning.....unfortunately, I put it on the wrong blog (blush). "The Clock on the wall says about 9am and the list on the computer says 174.....ALISA guessed 175. VERY close. Wonder if she came in and counted around the store! Congratulations Alisa. The packet of Little Yellow Bicycle goodies is ready for you at the store. Stay tuned for another contest....Hint: it will involve "followers" of the blog." The Clock on the wall says about 9am and the list on the computer says 174.....ALISA guessed 175. VERY close. Wonder if she came in and counted around the store! Stay tuned for another contest....Hint: it will involve "followers" of the blog. You'll notice that we have a new look to the design blog. Thanks to the design team members who have posted this year. There were so many wonderful things made, thought of and shared, that it is too bad we couldn't get them all posted. Our #1 New Year's Resolution at the store is to make more posts and to make them more regularly. Steps have been taken to make that a reality. Since you stopped by today, I hope you will remember the blog is beginning regular posting AND that you will stop back by to see what is happening here. Carolyn's blog will continue to include a little of everything - new product, some great projects, store announcements, her own personal stories and all the things you like over there. This blog will continue to have ideas, projects and other talk to stimulate that creative bug deep down inside of you. yesterday's deliveries brought October Afternoon. Very Merry by October Afternoon that is. This has been a greatly anticipated line with great embellishment stickers. The adorable school line called Report Card came in too. 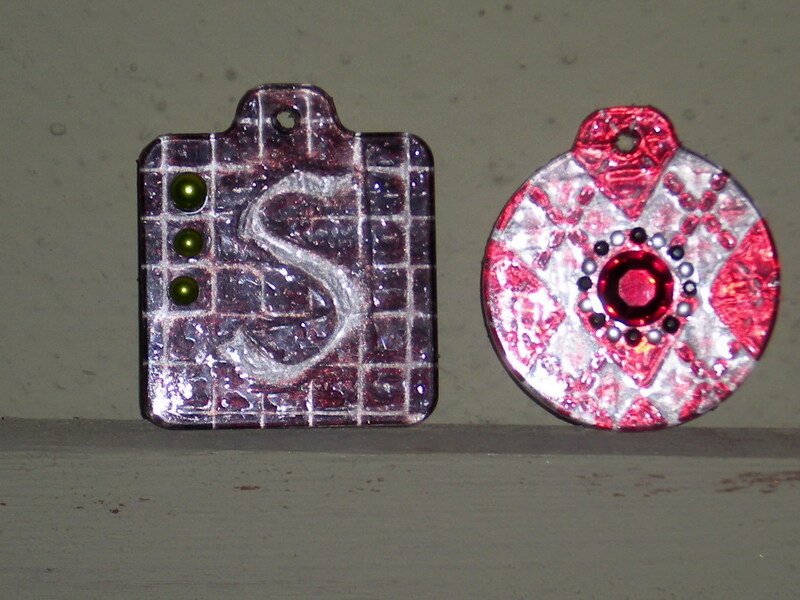 Thought we'd share results of the day 3 tags done by Carolyn too--Awesome huh?! For those of you doing the 12 tags by Tim, we just got in a re-stock of all of the memory glass and capsules. Of course we have the metals, stamps and inks as well as glass glitter and the little bells he is using today. Her December Daily book is looking awesome too! Maybe we can get some more pictures of it soon. 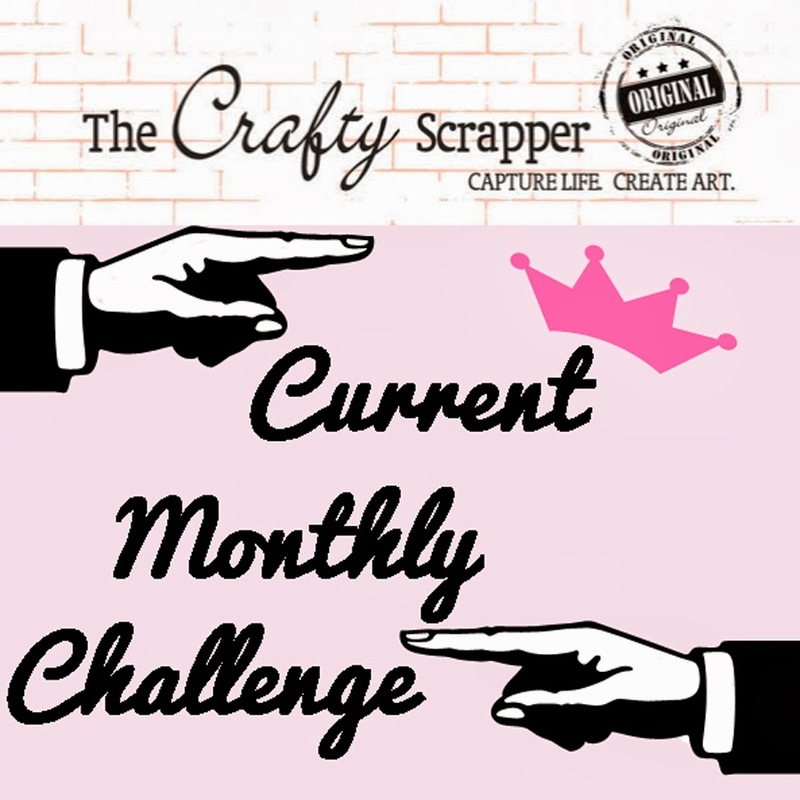 Although the store is not doing a December Daily book (just the personal one in the last post)...we do seem to have a lot to talk about on the blog each day. 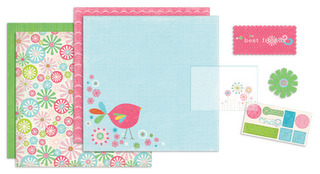 The overstock sale on Maya Road products is in full swing. The table has plenty more to choose from. Always a good thing to stock up on. We're trying to clear some space right now in the back room and the Maya Road "corner". So, thought we'd just put a little reminder out here for you. If you don't get our newsletter, please sign up on our website. Also, there is a spot now to sign up for posts to be emailed and as always, you can become a 'follower' and get updates that way too. Have a good one today! 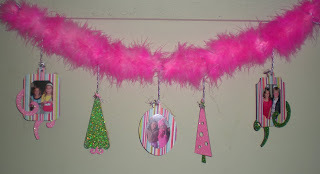 Last Saturday at our Pot Luck Crop, Penny a good customer and friend, was making this adorable December Daily. Another girl was making one that she bought as a kit, I thought what a great idea. 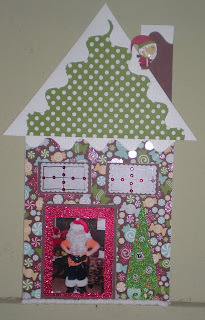 Of course I really didn't need another project since I am on a roll doing all of Wendy Vecchi's projects and now T!m Holtz's 12 Christmas tags, not to mention home life and my son's school stuff. The more I kept looking at her book, I feel in love with it. I liked her idea of cutting all the paper 6x12, adding envelopes, transparency, photo holders and acrylic pieces, then bind it with the Bind-it-all. So here I am working on day 2, but here are pictures of the first day. Even though all the Santa stuff didn't happen on the 1st, I wanted to start my book out with this since the paper did a awesome article on my husband. To learn more about this project, "December Daily" check out Ali Edward's description on her blog. 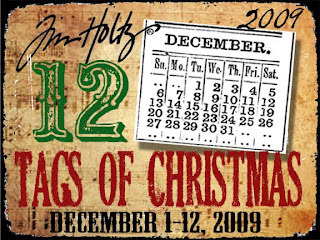 Nah, it is December 1st and TIM HOLTZ has decided to do the 12 tags of Christmas this year again. Last year, we had a lot of fun making them along with him. We took the techniques and used them in many other projects as well. His first tag is out and you will not be disappointed. Not surprising, he used rock candy crackle paint, rock candy stickles, picket fence stickles and his newest Snowman stamp. We have all of that in stock at the store. We also have wire for that great wired ribbon trick! Although there is not a list of what he plans to use on all the tags, we are pretty sure he will use the Ranger inks, Tim Holtz ideology items, Stamper's anonymous stamps and other Ranger products that we keep in stock. Of course, we know what kind of tag he uses and have those as well. As the designed tags come out, we'll do our best to get the items that he uses that we can't predict ahead of time for all of you. We'll be trying to make them as he puts them on his blog and hope many of you are planning to try the tags--at least one of them. He puts out the instructions in precise detail to make it as easy as possible, and you'll love the results. Let us know if you are playing. Every year my husband goes to extremes to white out his beard for the kids. Friday night he came in on the firetruck and helped our Mayor light the Christmas tree. Afterwards we did Santa pictures. This picture was taken without us knowing, sometimes those are the best photos! Friday kicks off the activities in Waxahachie for the holidays. All the stores are decked out in holiday splendor. Special treats are available at many. The home tours begin and Santa is really coming. Friday evening, all the stores on the square will be open extra hours, the tree will be lit at the courthouse and Santa will ride in to the square on a firetruck. Pictures can be taken with Santa as well. The ice skating rink will open. There is so much more - info HERE. We will be open from 10 am to 9 pm on Friday the 27th. Saturday the 28th til Midnight and we will add Sundays from 1 to 5 for your shopping. In addition, we will be serving hot apple cider and cookies. For this weekend--Friday, Saturday and Sunday, we will have EVERYTHING in store stock on sale for 30% off. This includes previously marked down items. (No punches will be given during the sale). Just a quick note to let you know the hours for this week. Wednesday (tomorrow), we will open at regular time (10 am) & close early at 4 pm. We will be closed Thursday, Thanksgiving. Friday, we will open at 10 am and will be open late--at least 8 pm- maybe later. Saturday, we'll be open from 10 am to midnight. Sunday, we will be open from 1 pm to 5 pm. Until Christmas Eve, we will be open our normal hours, including Friday until midnight and we will add in the hours of Sunday 1 to 5 pm. I am excited that eleven of you decided to come out of lurkdom and take a shot at the inventory. The actual number is 23,773 separate items. Yes, that is twenty three thousand seven hundred seventy three different items in the store. IF you take into account that for each of those, there are probably at the minimum 3 of them in the store, and on many items somewhere around 25....you can see why we dread inventory. It means counting somewhere around 200,000 individual pieces. Brook, looks like you were the closest. Next time you are at the store, pick up your PRIZE. Will update with other news tomorrow. Thanks. Around this time of year, the reality of how much product is in the store becomes all too clear. Decisions about ordering many times are weighed by whether or not we will need more before the first of the year, because at the first of the year, we do inventory. The thought of counting everything starts to make some of us cross-eyed. We spend about 2 to 3 days counting all of the things in the store, comparing it to the computer record, updating the computer record and then starting the year with an fresh start. I thought that it might be fun to put out a challenge to those who read our blog. The person who makes a guess closest to the actual amount without going over will win a prize package. We'll throw in some papers, a punch (the wings one pictured here), some flowers and maybe a stamp or more. It will be worth about $30.00. I hope that be motivation to make a guess. I will look for the winner Monday the 23rd. I can only hope there will be more than one response in our comments field. I'll try to clarify....Say a paper is called Mistletoe and we have 25 sheets of it, for this purpose it is one item, not 25. Make sense? For obvious reasons, anyone who works or worked at the store and can see the number in our computer is not eligible to guess or provide assistance to any guessers, but other than that, the rules are simple: post a guess before Monday evening, I will pick the person closest and then will put it on the blog for all to see. Cute name, huh? It is the name of a Bella Stamping Rubber Stamp that came into the store today. Several have been asking about them and wanting certain stamps. We received several images that we hadn't had before as well as some sentiment stamps. We got a couple of the images that we have been requested to get back in stock as well. Some of the other names are wreath-a-bella, tis-the-season-to-be-jolly bella and bettina butter cream. Some of the stamps are holiday, but more are everyday or birthday. I think it would be a fun to determine the names for their stamps. "bella" this or "bella" that. Also, for those who were waiting for the snow markers to get back in stock, we received several of those today as well. Wish I had a picture of the bellas to show you, but I could only put this picture out here tonight! Well, we really didn't have any of those visit us at the store today, but we think you'll be excited about what we did get done. Annette brought in the items that she will teach in the Santa's Workshop for pre-teens next week. Cute picture frame / gingerbread house. SO, get those pre-teens signed up while you can! A second thing ready today is the book we will use for the cookie swap/class in December. During the class, you will complete this book and swap recipes which can be placed into this book. Dates of the class will be December 15 and 19th at 10:30 am each day. Pictures just can't pick up the full prettiness of any of these projects. and full details for both classes are here. 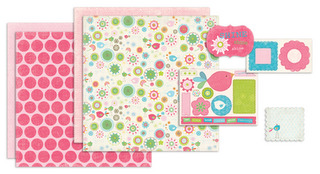 And for those who have been patiently (&/or impatiently) waiting....Flower Soft is finally here! 15 colors, a few of their stamps and a couple of kits. We definitely have the polar white color for this time of year. We plan to have it incorporated into a card class in January. Back in late October, when we were putting out Christmas decorations and starting to get all of the Christmas products into the store, we had people-mainly children, ask us why we were putting Christmas out already. One eager youngster asked his mom "when is Christmas?" I think he was really counting on it being sooner than it was at that time. 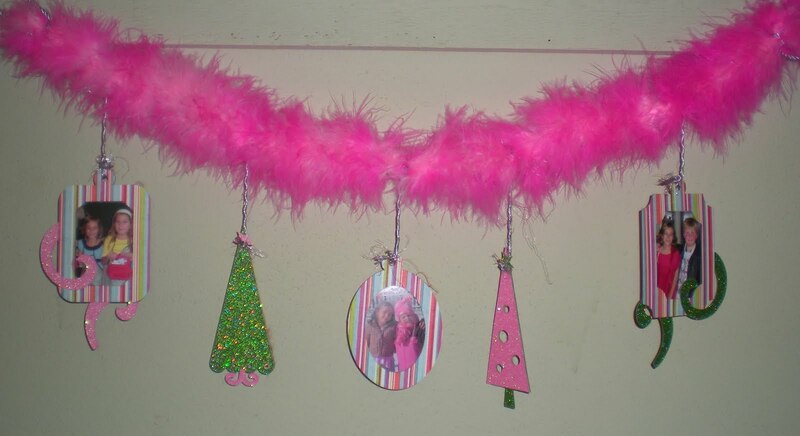 Hopefully, you know that we decorate for Christmas and get those products in the store early so that our customers can get ready for the holiday. 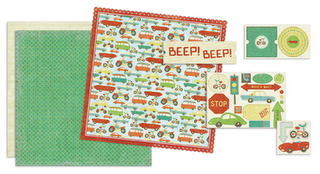 Making gifts and cards isn't as quick as just buying something pre-made and we want to give you plenty of time. Today I was counting the Christmas & Winter paper lines. I counted 25 different lines. 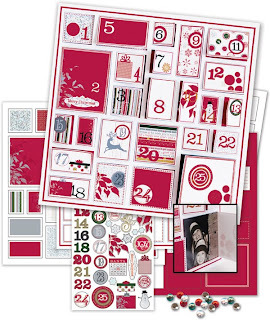 Aside from scrapbooks and cards, we have the pieces for making a yearly calendar, decorative trees, advent calendars, wreaths, planners, ornaments, recipe books, canvases, shadow boxes and many other items. If you need some ideas, come in and take a look around. The design team members are bringing in things every day. Also, take a look here for some ideas from past years. Oh MY! Today we received an order of the newest Maya Road items. They JUST released some items this week and our order has made it already. It is sometimes really hard to work at the store, know that there are new releases coming, finally seeing them online and then waiting for them to come in. Ok, there are worse things, but you know what I mean... This time though, there was a quick delivery, so the worst part of it all now is what to buy....food or mist? Oh, you thought I'd say which MR thing to buy? ha, never a challenge...ALL of it is awesome. Did you notice those cute little trinket pins? Heart shaped tops! Perfect for all occasions. Carolyn will have a few of them poking through flowers soon. Oh, look, new flowers to poke them through! Aren't these great colors? Not enough colors of mist for you? Well, there are many more now. I have only included a few of them here. There is Carnation Pink, Mulberry Red, Fern Green, Hydrangea Blue, Dark Cornflower Blue, Silver Plated Metallic Sunflower Yellow. We received samples of all of the mists, but the mists themselves won't be in the store until next week. You can reserve it though by calling or coming by the store and paying for what you want. We will put it back for you. Only limited numbers of the mists will be coming in, so we think it might go pretty fast! Speaking of food. There is a new mini chipboard set of cooking utensils. Perfect to use in a class for January! 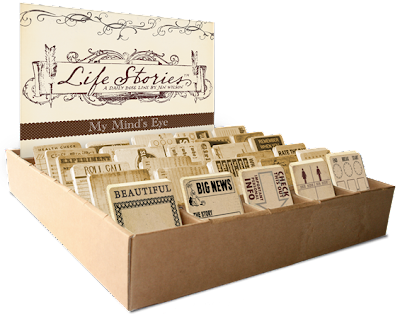 A new line we received over the last week is one called Life Stories by My Mind's Eye. 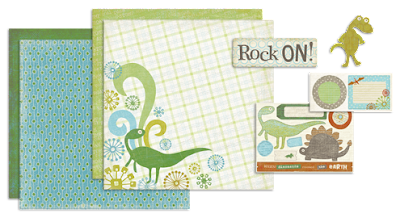 Many people scrapbook or craft to create books and other items for their children OR to do a heritage book of their own families. This line is created to make that process a little easier. One of the ways they do this is with these daily dose cards. Each one has a different prompt for journaling--trips, pets, children, and many others. The papers are also set up to allow an easy way to complete the books. 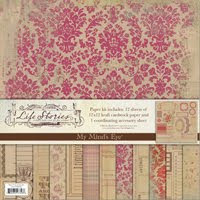 About half of the papers are printed with designs such as flowers, plaids, etc. The other half (or so) are forms essentially. They are designed for fill in the blank information about a person's life. 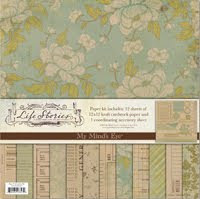 The colors are muted and all of the line is on a kraft paper type background. This allows a person to individualize the style to themselves. Or so it seems to us. You can go as bright or as soft as you desire in the color scheme and as pop or vintage as desired in styles. In January, we are going to offer a class that will cover several weeks to make a book "about me". This was done a couple of years ago with great success. Annette has come up with some wonderful ways to make this into one book. More information will come out about this later. Let's take a break from the new products (at least on the blog) to look at some of the other fun going on here at the store. Saturday, we had two classes going on. One side of the store had a fun holiday card class going on. Annette was the teacher in this class. The group made five great cards. Well actually, they were gifts within cards. Each card had something additional, like an ornament, or a spot for gift card or a spot for photos, making them more than just a card. They chalked, stamped, sewed, glued, sanded and did a lot of other fun stuff to the papers! On the other side of the store was a class making book covers out of grungeboard. Many had not ever worked with grungeboard (or so they wanted us to believe). They made some great covers and each one turned out different. The project was easy to individualize with colors and words. Carolyn was the teacher of this class. 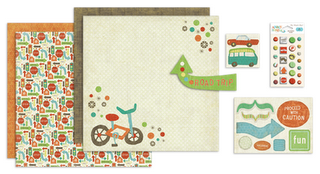 She brought this class back from a workshop she went to that was created and led by Tim Holtz. As you can see, they used their hands and inked, stickled, sanded, bent and poked holes in the grungeboard. This one of those products that can be folded, stapled and otherwise manipulated--well actually, that is how you use it! Here are a few of the book covers. See the great differences? Makes you want to get your fingers inky doesn't it? Both of these classes are being held again. 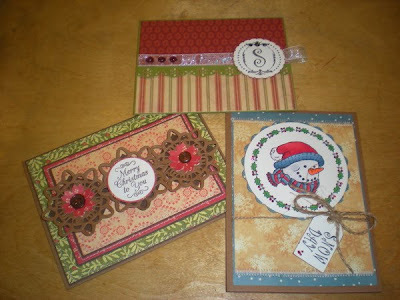 The holiday card class is Thursday November 12 at 10:30 am and is only $30.00. The Grungeboard class is being held again on Thursday November 19 at 6:30 in the evening and December 12 at 10:30 in the morning. Check out the Events Page of the website for other classes as well. Another new line that we have picked up is the JUSTRITE stamps. These are stamps that allow personalization easily among other functions. There are stamp holders of different sizes, then these can be adapted with sets to make about any combination you might like. Here is a picture of a starter set. As you see, there are sayings, monograms and borders shown. Notice the wording "completely interchangeable". 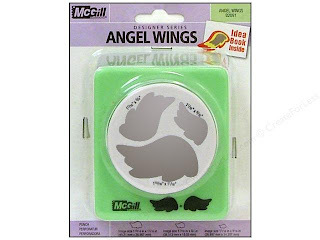 We have several of the kits that can be purchased separately of this company. On November 21 at 3:00 in the afternoon, there will be a class to play and learn about these stamps. In that class you will receive one of these starter sets (pictured above). If that isn't enough, here are the three cards that you will create! AND, the class is being conducted by Christy Gilbreath. She is an excellent card maker and some of you may know her from her store that she had in Fort Worth in the past. You'll notice that on these, there are shapes from Nestabilities used. The store is also starting to stock some of those as well. This is a new addition for the store, as you know. 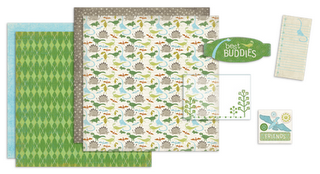 Switching gears, here are some more new papers that will be out on the floor Monday. Very cute stuff!! My Mind's Eye, Abbey Road. Within this line are three groups of paper and embellishments. And then Whirlybird: Just the Girls and Best Friends-- for little or big girls. More FUN, NEW stuff in the next post too!